This is an interesting song in that it utilizes my whole vocal range – from bass to highest note. Sometimes it can take a long time from a melody and a sketch of a song to a finished version. This is the song that started a new age in my composing in 2011. I had written ballads before but with this song I started to make (without knowing it at the time) a full album of romantic vocal ballads. I hope to release the full album next year, 2017. The album Tree of Love – and Other Ballads from the Darkened Sun and this song have been many years in the making. I am glad to share this with You, finally. Hope you enjoy. Personally my favorite part is “the last dance” with the piano at the very end of the song. It feels like “after all said and done”… And it is meant to sound “clumsy”. And honest. And real. Heartfully warm special thanks to Joonas, Hanne, Matti, Liis, Kriku, Sini (and little boys), to my loving parents and to all others who have supported my music this year and in the past years – it has given me strength and inspiration to work day and night on this and other upcoming albums! Also thanks to Liis for suggesting the harmony multi-vocals :). Update 23rd December 2016: As a Christmas bonus here is the original acoustic 2011 live recording of “Tree of Love” – Merry Christmas! The wintery scene of trees on the single/album CD cover is from the upcoming post-apocalyptic Sci-Fi film Soulweaver: Requiem for Earth. “- May I have this last dance with you? – Can I take you to the dance floor? 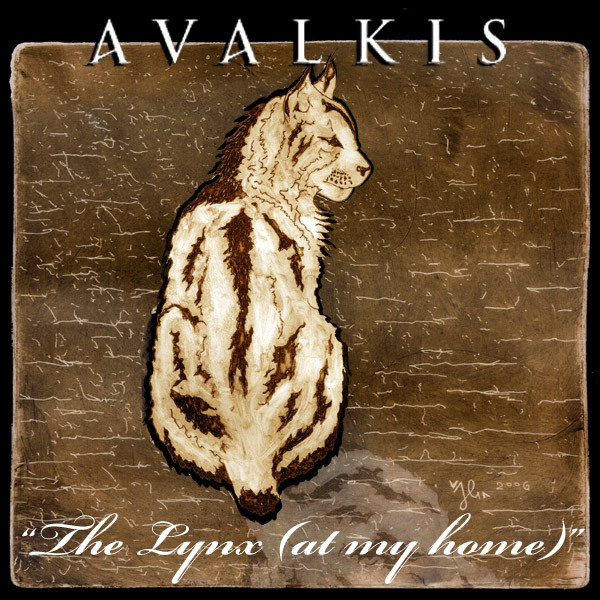 Here’s my newest song – an electric guitar ballad: “The Lynx at My Home” (2016). This song is dedicated to my cat and all the cats I have loved in my life. The track will be in the upcoming album Tree of Love – and Other Ballads from the Darkened Sun. Featuring f.ex. acoustic/electric guitar and piano ballads, celt and medieval inspired songs. Of course the whole song itself also tells about life, women and broken relationships. EDIT February 25th, 2017: Song version updated – some tuning issues were fixed. Here’s my newest song – a guitar ballad, called “Scorpion” (2016). Hope you like it! This is the first released song with my new artist name Avalkis. The track will be in the upcoming album Tree of Love – and Other Ballads from the Darkened Sun. Featuring f.ex. acoustic/electric guitar and piano ballads, celt and medieval inspired songs. UPDATE: Due to request from my good friend and artist Joonas here is the whole “Scorpion” song with the ambient intro that originally belonged with it :). PS. The original working title for this song was “A Seed of Hope” which referred to “Acid of Hope”. Because it’s interesting to note that the base for this song is originally an acid trance song I composed in 1998. That might explain some of the sounds and melodies appearing in the final build-up :). Also a certain 1980s/1990s nostalgia is present. I will release the trance version too later.